I really hate sports, but I really love my husband. 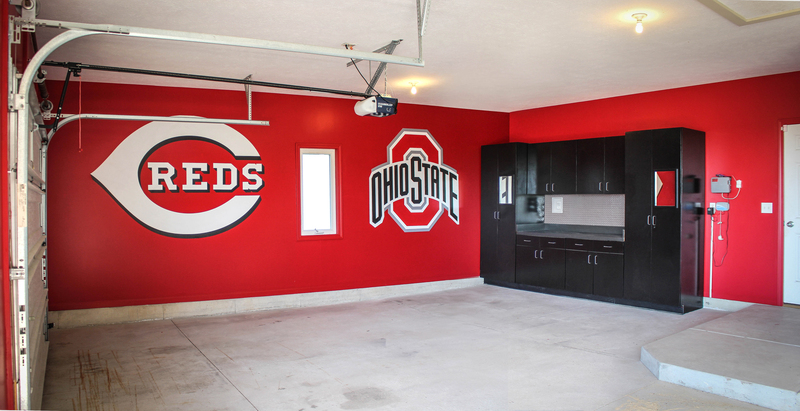 So for our garage, I put my own personal tastes aside and made this for him. He is originally from Ohio, but now lives in Michigan. Fingers crossed we don’t forget to close the garage door and get egged. 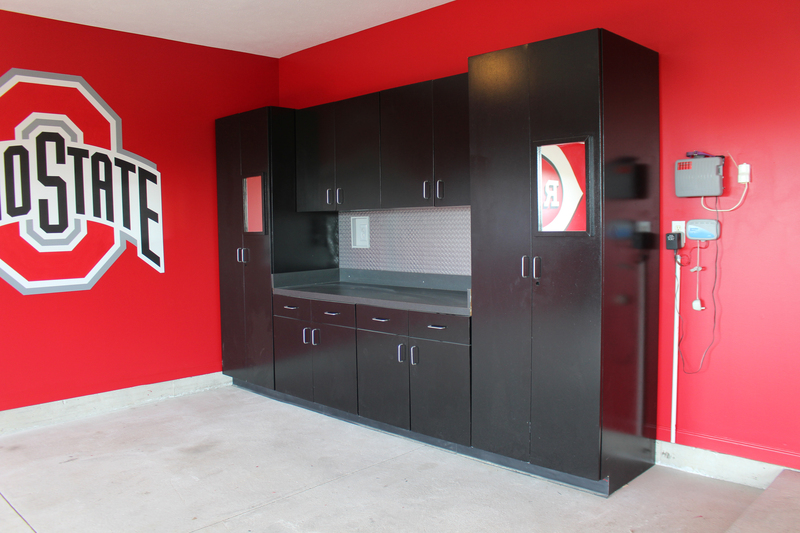 He wanted to make the laundry room a scarlet red color. 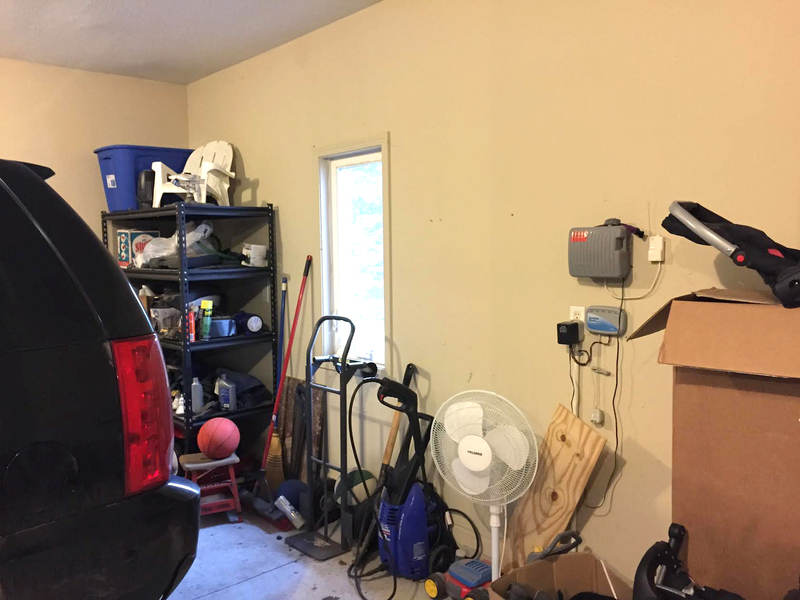 The trade off for that was: I make his garage stall red and get to do whatever I want in the laundry room (funny because I spend more time making things in the garage and he does all the laundry). Yuck. This very long journey began by browsing Craigslist, searching for some kind of storage shelving system. I found a church that had purchased an old abandoned elementary school. They were gutting it and getting rid of hundreds of sections of cabinetry. They were selling each section for $30, so this entire thing was $180!!! Score. The cabinets were originally a horrible marbled green color, but I happily primed and painted them for that price. First things first though, I put frosted vinyl over the garage windows. Next I had to board up the back wall window because that is where the cabinets were going. Installing them was a challenge. They are HEAVY. It took me and my husband several days and we thankfully only suffered minor injuries. For the backsplash I looked into buying tread plate sheet metal. Wowza that stuff is expensive. While aimlessly wandering through Menards, I came across vinyl tread plate meant for the floor. That was only a few dollars per foot…a fraction of the real stuff’s price. I used an adhesive to paste it to the wall and then nailed it in place for extra security. 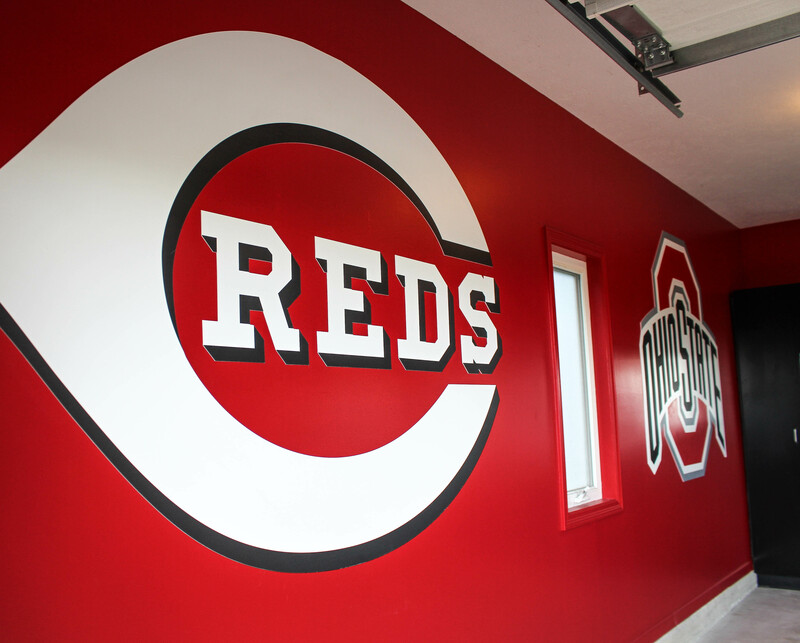 I had no idea how hard it is to paint a wall red. I bought the second best paint they had at Home Depot (what I always get), thinking that I could do two coats and be done with it. Nope. Four coats later I went back to the store. After some discussions, they gave me a gallon of their best paint for free. I did one more coat of paint and called it good. Finally, the best part…I did some freelance design work for my old job and in return they made us these giant 5+ feet styrene logos. They went up easy with heavy duty double stick adhesive. Despite my feelings towards sports in general, I think it looks pretty impressive.